Bixi, Toronto's troubled public bike-sharing service, will get a new name and logo on Monday. 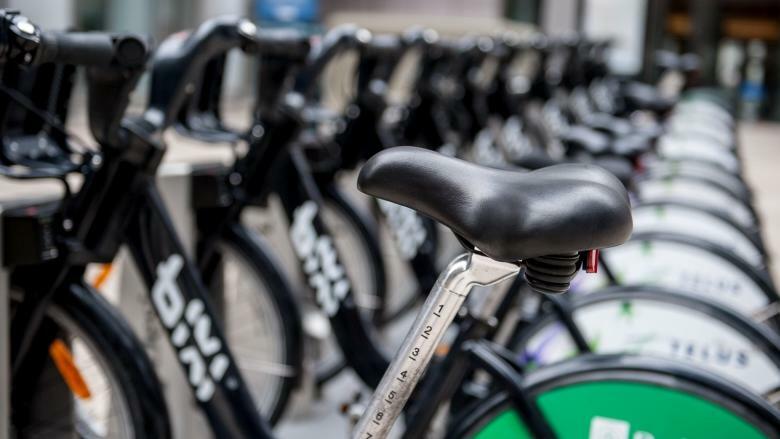 Like proximity to good schools or metro stations, proximity to bike share stations increase a home’s resale price, a new study says. A team of researchers at McGill University looked at thousands of homes sold in Montreal before and after bike sharing was introduced. Even accounting for inflation and other factors that could affect the sale price, the team found that proximity to a Bixi Montreal location increased sale prices on average 2.7 per cent. “It is that much,” says Ahmed El-Geneidy, an associate professor at McGill’s School of Urban Planning and the study’s lead author. Transportation has long been a known factor affecting home prices, El-Geneidy says. Nearby bus stops, subway stations or easy access to freeways is a key factor in home purchases. El-Geneidy, along with urban planning student Dea van Lierop and Rania Wasfi, a doctoral student in the school of geography, looked at tens of thousands of MLS sales in Montreal between 1996 and 2012. Looking for homes that sold at least twice, before and after the bike share program was introduced in spring 2009, they narrowed the data down to 5,037 multifamily housing units. They compared units that had a bike share station within 800 metres to those that did not. “Policy makers wishing to increase the economic benefits of the municipal government and improve local urban environments can increase the availability of a bicycle share system as this will likely result in increased property sale prices, improved neighbourhood health, and a more vibrant urban environment,” says the study, to be published in the journal Transport Policy. More than 500 cities around the world have bike share programs. Montreal introduced Bixi six years ago. Toronto, Ottawa and Hamilton have followed suit. Calgary is developing a network of bike lanes but council has delayed its decision on a bike share program originally expected to debut this year. Vancouver has been struggling to get bike sharing up and running for several years. The program was scheduled to launch this year in the West Coast city but city officials are looking for a new partner because, despite the purported popularity and the health benefits, the two main companies providing bike share in North America have struggled financially. Bixi, owned by Public Bike System Co., a spinoff business of the city of Montreal, filed for bankruptcy protection last year after the city rejected another financial bailout. The city has taken over the local operations, and Toronto turned to another provider. That provider, Alta Bike Share, based in Portland, Ore., sought investors last year as it struggled financially, as well. The company has now been renamed Motivate, after it was purchased by New York-based Bikeshare Holdings LLC last year. Jerry Dobrovolny, the man in charge of the bike share system for the city of Vancouver, says the financial struggles of Alta and Bixi – which had partnered to provide the city’s system – derailed Vancouver’s plan. But the city will launch a new procurement process in the next few weeks. “We are disappointed that we haven’t had a system operating for the last couple of years but we had firm conditions that couldn’t be met,” Dobrovolny tells Yahoo Canada News. Vancouver didn’t look at the effect on home prices in deciding to pursue bike share but Dobrovolny says he’s not surprised at the study’s findings. Fewer than half of the trips in the city are by car now. Walking and cycling are both a big part of the public transportation system, he says. El-Geneidy says Bixi struggled because of management, not because the service is bad. The increased home values mean more taxes for the city that offset setup costs, he says. That’s in addition to the health and environmental benefits. “Put all these together and you find it’s a good system to have,” he says.